Boulder, Colorado. September 4, 2014 – Two University of Colorado Boulder student aerospace engineering science teams have won prestigious international and national awards for the design of real-world space missions to Mars and the moon. One CU-Boulder student team placed second in the world in a competition to design the best concept for a two-person manned flyby of Mars mission as inexpensively, safely and simply as possible. The competition, the International Inspiration Mars Student Design Contest sponsored by the Mars Society, required the teams to choose a launch trajectory, a launch vehicle, flight systems and a concept of operations. The flight system design selected by the CU-Boulder team included environmental control and life support systems, solar flare protection, navigation, communication and re-entry and landing technology for a proposed 2018 mission to Mars. The CU-Boulder proposal — the Mars Approach Vehicle and Earth Return for Interplanetary Crew, or MAVERIC — included independent launches of an inflatable cargo module and an inflatable crew module equipped with a re-entry capsule. The two modules would link up above Earth for a 501-day journey that would swing around Mars, then return to Earth for an ocean splashdown. As part of the 38-page CU-Boulder MAVERIC proposal, the students developed plans for crew activities ranging from exercise, craft maintenance, microgravity and plant growth experiments to ground communication, public outreach efforts and educational and entertainment media like videos, video games and electronic books. The winning team was made up of a coalition of eight United States and Japanese institutions, including Keio University in Tokyo and Purdue University. The second-place CU-Boulder team included three students working under adviser and aerospace engineering sciences Associate Professor Dave Klaus — doctoral student Christine Fanchiang and master’s degree students Roger Huang and Eric Threet — along with four other students who participated in the earlier class design project from which the proposal was derived. The judging panel was made up primarily of current and former NASA officials. Founded in 1998 by Colorado aerospace engineer Robert Zubrin to further the exploration and settlement of the red planet, the Mars Society now has more than 4,000 members and 6,000 associate supporters in more than 50 countries. Members include astronauts, astronomers, engineers, entrepreneurs, educators and students. “We were very focused on putting together a realistic space mission using existing technologies, which I think helped us stand out in the competition,” said Threet, a Colorado Springs native who expects to receive his master’s degree in aerospace engineering from CU-Boulder in the spring of 2015. A second CU-Boulder aerospace engineering team tied for first in the graduate student category for a national student design competition known as Revolutionary Aerospace Systems Concepts — Academic Linkage, or RASC-AL, sponsored by NASA and managed by the National Institute of Aerospace. The CU-Boulder team proposal, called the Lightweight, Innovative, Technology-driven Habitats for Space, or LITEHABS, is a permanent space habitat that would be placed in looping orbit between Earth and the moon’s orbit to support human space exploration on the moon and deeper into space. The LITEHABS design includes both a solid inner core and an inflatable outer core made with a polymer known as Vectran, which is twice as strong as Kevlar used in bullet-proof vests and could deflect particles of space debris traveling at six miles per second. LITEHABS would have two docking ports for spacecraft and crew. The inflatable wall of the habitat, which would be roughly 40 feet long and 36 feet in diameter, would be filled with water. In addition to providing water for the crew and protecting them from harmful space radiation, the water wall was designed with compartments for air revitalization using algae photosynthesis to take up carbon dioxide and release oxygen. The water wall also would control habitat humidity via water vapor condensation. The habitat could serve multiple purposes, including a supply depot, a medical outpost, and a facility for the inspection and repair of other space vehicles. The orbiting, inflatable habitat also could be used to provide support for a proposed NASA mission by CU-Boulder to deploy a low radio frequency telescope on the far side of the moon. The RASC-AL team, which submitted a 26-page proposal, included graduate students Jonathan Anthony, Christopher Christensen, Asa Darnell, Christine Fanchiang, Matthew Milanese, Christopher Nie, Tobias Niederwieser and Elliot Russell. The team also was advised by Klaus. Christensen is from Broomfield, Colo. 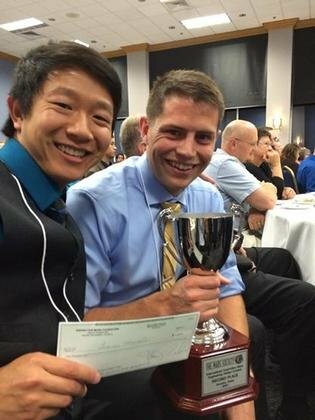 In 2012 and 2013, CU-Boulder engineering teams also placed first nationally in the annual RASC-AL graduate student competition. In addition, a team involving CU-Boulder, Delft University of Technology in the Netherlands and the University of Stuttgart in Germany placed second in the 2012 national RASC-AL competition. “CU-Boulder has been a powerhouse in these competitions in large part due to the Space Habit Design course,” said Threet, who hopes to eventually conduct research on human space vehicles.